▲On March 22nd, the GSC attended a questioning session hold by the Office of Student Affairs Department. According to the Office of Student Services, the former 47th General Student Council, “Baek-bal-baek-joong”, has not returned the enrolled students’ name list, which was needed for the Student’s General Meeting held on September 17th, 2015. The Office of Student Services asserted that only the name list, which checked students attending the Students’ General Meeting, can verify whether the meeting was accomplished or not. Regarding the claim, the former vice chairperson, Kim Gun-joong, asserted that the achieved Students’ General Meeting can be verified by meeting’s records and the vote number. In addition, since the Students’ General Meeting is the top legislative organization in students’ regulations, the school does not have any rights to argue about it. Enrolled Students’ List for the Students’ General Meeting Thrown away. On September 9th, 2015, Choi Gwang-baek, the former president of the GSC, took the list that contains all the names of Donggukians from the Office of Student Service to utilize it in the Student’s General Meeting. However, he has not given it back to the Office of Student Service until now. It is against the regulations which the GSC and the school had made when concluding a contract regarding the Students’ General Meeting. The written agreement, which the former president had signed, states that the enrolled students’ name list should have been returned in three days after the Students’ General Meeting. Since the list included students’ name, their major, their grade and their student number, it is closely connected with the privacy protection legislation. About the issue, on March 22nd, 2016, at the Lotus Hall, the Office of Student Affairs department had a questioning session with the General Student Council. However, it did not notify the GSC of this schedule, which inevitably made the GSC to be absent in the conference. Regarding this matter, the present GSC expressed its unpleasant feeling. Therefore, it was impossible for the former chairperson Choi to attend, who is the one directly involved in this situation. 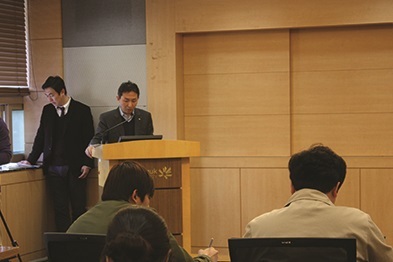 Instead of him, the present vice chairperson of GSC, Jo Seung-woo and the chairperson of General Representative Council, Park Moon-soo spoke for the former GSC’s stance.